When doing a total furniture refinishing job on a piece or set, the first thing that needs to be done is to remove the old finish. Old paints, stains, and varnishes can be very difficult to remove, the best way to strip the old finish away is with the use of chemical strippers. This can be a hard, messy, and dangerous task if you’re not accustomed to working with these products. 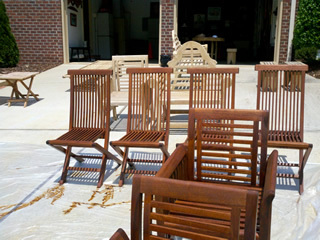 DFW Finishers will be delighted to take care of your furniture refinishing and furniture painting needs. We can do a total restoration on your piece or set; do a stain, varnish, or painting refinishing project for you; or add a fresh coat of paint to your already painted pieces. We will use equipment that is able to produce a fine spray finish on your furniture, making it look like it just came out of the box. Whether your furniture just needs a good cleaning, has several coatings that need to be removed before refinishing, needs complete painting, or just needs a fresh coat of paint, our final product will be completely professional and your satisfaction is guaranteed. DFW Finishers is skilled and equipped to work with all sorts of oil-based and water-based paints, stains, and coatings. DFW Finishers of Holly Springs, North Carolina are: Professionals at furniture painting including furniture refinishing and furniture restoration; and An experienced furniture refurbishing business in the Raleigh, NC area. We service the areas of Cary, Holly Springs, Fuquay-Varina, Apex, Raleigh, Morrisville, Garner, and Durham, NC. Also serving Chapel Hill and the Greater Triangle area.